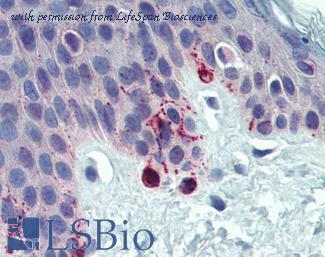 Anti-TYRP1 /gp75 antibody IHC of human skin. Immunohistochemistry of formalin-fixed, paraffin-embedded tissue after heat-induced antigen retrieval. Antibody concentration 5 ug/ml. This image was taken for the unconjugated form of this product. Other forms have not been tested. 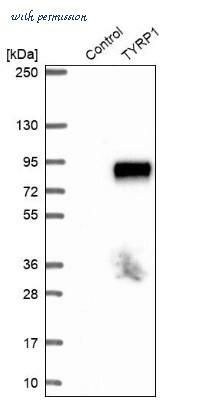 TYRP1 Antibody western blot of NCI-H460 cell line lysates (35 ug/lane). 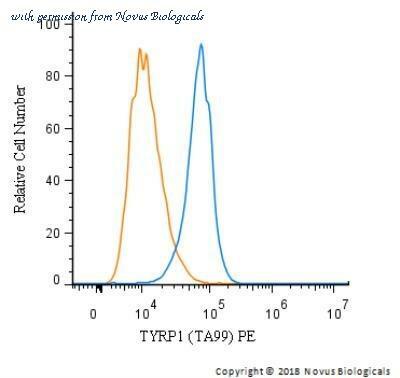 The TYRP1 antibody detected the TYRP1 protein (arrow). Western Blot: TYRP1 Antibody [NBP1-88370] - Analysis in control (vector only transfected HEK293T lysate) and TYRP1 over-expression lysate (Co-expressed with a C-terminal myc-DDK tag (3.1 kDa) in mammalian HEK293T cells). Flow (Intracellular): TYRP1 Antibody (TA99) [NBP2-32906] - Flow Cytometry: TYRP1 Antibody (TA99) - Azide and BSA Free [NBP2-34720] - An intracellular stain was performed on SK-MEL-28 cells with TYRP1 Antibody (TA99) NBP2-34720PE (blue) and a matched isotype control (orange). Cells were fixed with 4% PFA and then permeabilized with 0.1% saponin. Cells were incubated in an antibody dilution of 2.5 ug/mL for 30 minutes at room temperature. Both antibodies were conjugated to phycoerythrin. Image using the Azide and BSA Free form of this antibody.